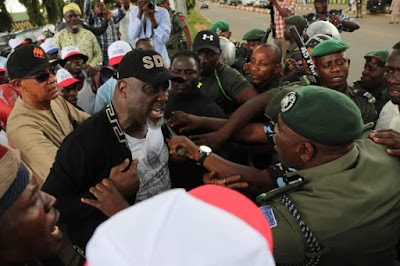 The Nigeria Police Force says Sen. Dino Melaye and Sen. Ben Murray-Bruce are to report to the Police Command in the FCT on Oct. 8 and not to the IGP monitoring unit for investigation as earlier stated. The News Agency of Nigeria (NAN) reports that the force on Oct. 5 had invited the duo to report to the IGP monitoring unit for investigation for public disturbance in Abuja. NAN also reports that the duo who were members of the PDP that protested the outcome of the Osun governorship election at the force headquarters on Oct. 5, allegedly attacked policemen. A statement by the Force spokesman, acting DCP Jimoh Moshood on Sunday in Abuja, said that the two Senators were captured on camera for their roles in the disturbance. Moshood alleged that the duo pushed and hit policemen to forcefully gain entrance into the Force Headquarters to cause damage to Police equipment and Government properties. He said that further investigation was ongoing to determine the level of involvement and culpability of other individuals during the protest. The spokesman said that the invitation letters have been sent to them for compliance. “The Federal Capital Territory (FCT) Police Command has the statutory jurisdiction to investigate the matter,” he said.